I have to let you all know, this was my first time making this super easy Tater Tot Casserole recipe! My husband had it growing up, and to my recollection we never did! It turned out to be a crowd pleaser so I thought I would share it with you all for nights when you need something super easy and quick! Add cream of mushroom soup, ketchup, and Worcestershire sauce to meat mixture and mix well. Spray bottom of a 9×13 casserole dish and spread meat mixture evenly across bottom. Arrange tater tots evenly over beef layer. Sprinkle shredded cheddar cheese evenly over the top. Bake in preheated over for about 30 minutes or until cheese is bubbly. I grew up with Tater Tot casserole, too. Our version didn’t have ketchup; I’ll have to try that. It also had mixed vegetables instead of frozen peas. Unfortunately, I have a tater tot hating dh and children who are unwilling to try it. Oh, well. It is always a crowd pleaser at our house too. Ours has mixed veggie instead of peas also. 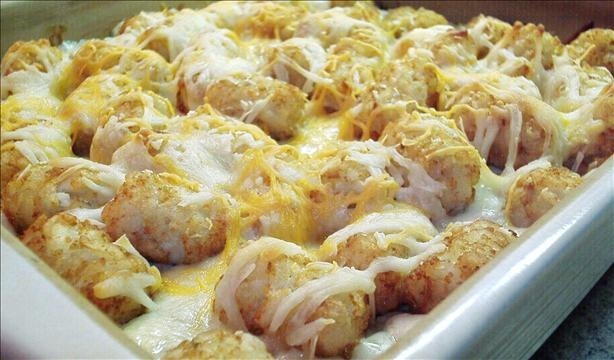 This is a favorite in our house – all I do is mix the cream soup in with the meat, spread it in the bottom of the pan, put a single layer of cheese slices (you know, the ones that come individuall wrapped), and then top with Tater Tots 🙂 Super easy. Never thought about adding veggies – might have to next time! Voted for you guys! We love TT caserole here too, our version came from a crockpot book called “Fix it and Forget It”. We LOVE this recipe!! It’s sooooooo good. Just made it and added zucchini! Delicious! Hubby hates cream of mushroom soup. Anyone use any other kind of soup? I really want to try this for the kiddos! We love TTC at our house, too. My youngest asks for it every couple weeks. We just do the meat mixed with cream of mushroom soup, sandwiched between tator tots, though. Then I make some egg noodles to mix in with it.